“Look at the baby!” An elder fairy cooed then sipped nectar of jalapeño. “Oh, she’s so cute!” A barrista fairy chimed in, while handing out honey-frappes. “Look how pink she is!” A third fairy exclaimed, sipping her honeysuckle frappuccino. Happy Memorial Day, everybody, from the Rhododendron Fairy Cafe! Great little conversation, and I love the honeysuckle frappuccino!!! 😀 Those flowers do look perfect for a fairy baby nursery, they swing in them like hammocks! I did like their feedback very much, thanks!! Fairies get frappucinos? Pink ones? 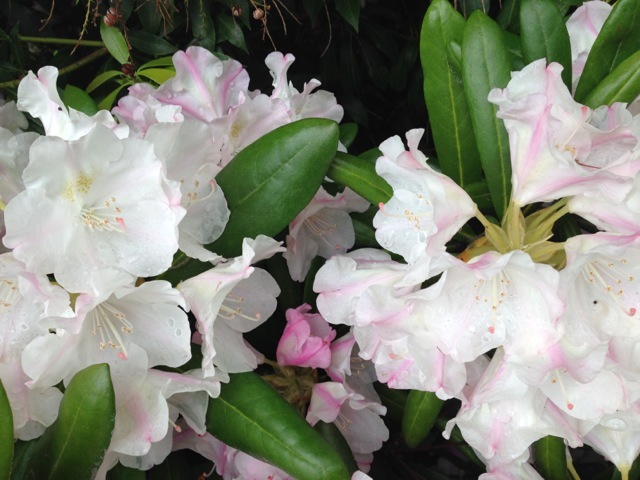 Gorgeous rhodie photos. So beautiful and eye catching. LOL Uh, oh! Call the cute police! This was neat! I had a caramel frappe while hanging out with human friends today! Excellent, sounds yum and fun! Beautiful. A blessed weekend to you, Brenda. Thanks!! I hope you are doing well, too! Didn’t overdo the gardening! So Beautifully refreshing and Fantastically wonderful ! Thanks! Have a great weekend, my friend.